There was no aspect of human existence which did not exercise some fascination for him and around which he did not allow his mind and fertile imagination to play; and where, as a young man, I had been brought up in a world in which the secular and religous were separate, he insisted that in poetry, music, art and life they were one, and that there should be no dividing line. That is Leonard Elmhirst writing about the Bengali poet, composer and educationalist Rabindranath Tagore. With his American wife Dorothy, Leonard Elmhirst founded Dartington School which was modelled on Tagore's educational experiment at Santiniketan in Bengal. The summer school at Dartington has made a major contribution to contemporary music; the musicians who have participated in it include Peter Maxwell Davies, Igor Stravinsky, Maderna Boulez, Luciano Berio and Karlheinz Stockhausen, and Sir William Glock presided over the summer school for some years. In 1913 Rabindranath Tagore was awarded the Nobel Prize for Literature for his collection of poems Gitanjali (Song Offerings). A number of composers have set Tagore's poetry including Frank Bridge, Rued Langgaard, Manuel Ponce, Jonathan Harvey and, most famously, Alexander Zemlinsky in his Lyric Symphony. Rabindranath Tagore championed the culture of his native Bengal and considered the lyrics of the Bauls, the mystic minstrels of the region, to be one of the glories of Indian civilisation. The Bauls practise a syncretic religion and syncretic forms of worship, which reconcile disparate and sometimes contrary beliefs, hold a particular fascination for musicians. Theosophy is a syncretic religion and this synthesis of Christianity, Hinduism, and Buddhism attracted in varying degrees Alexander Scriabin, Gustav Holst, Edmund Rubbra, Dane Rudhyar, Ruth Crawford Seeger, Cyril Scott, and John Foulds. Elements of Tantra, Sufi Islam, Vaishnava Hinduism and Buddhism are incorporated into the Bauls tradition which draws its adherents mainly from Sufi Muslims and Vaishnava Hindus. The definining feature of Bauls, whose name means 'madcap', is that, unlike the Sufis, they are not seekers who mourn their separation from God. Instead they decry organised religion and believe that the divine exists within and can be released by joyful celebration. Music plays a central role in this joyful celebration and the Bauls are known by their songs and by their living example, rather than for their doctrine or secret practices. The music of the Bauls is derived from Indian ragas but uses its own structures and forms. An important role is played by the ektara, this is a single-stringed instrument descended from the gopiyantra said to have been played by Krishna's cowherd maidens. My header image is one of a number of CDs of music from the Bauls of Bengal; this one is an excellent compilation titled A Man of Heart on the Italian label Amiata Records. Allen Ginsberg, sometime lyricist for Philip Glass, travelled to Santiniketan in 1962 after reading Rabindrath Tagore's translation of Baul lyrics. Later the great Baul singers Purna Das and Lakhan Das Baul met Mick Jagger in France and recorded at his studio there, travelled to New York, were taken up by Bob Dylan's manager Albert Grossman and worked in Dylan's studio near Woodstock. 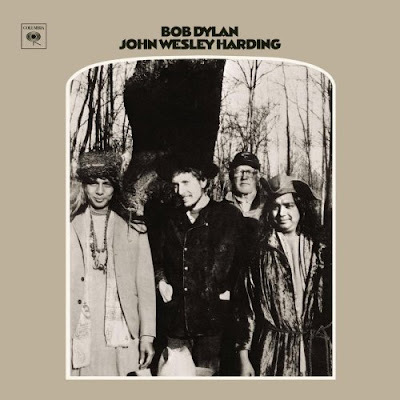 Purna Das and Lakhan Das Paul appeared alongside Dylan on the cover of John Wesley Harding which can be seen below. Which takes me back to the start of this post, there should be no dividing line. * More Dylan artwork here. ** Bede Griffiths, who once met Cornelius Cardew, developed his own syncretic blend of Hinduism and Christianity. Read more in This man is dangerous. *** My header quote is from The Elmhirsts of Dartington, the Creation of a Utopian Community by Michael Young. Still available from Dartington via that link and well worth seeking out for, among other things, the story of Dartington's little known American connection. **** The recently published The Honey Gatherers by Mimlu Sen is about the Bauls and their musical tradition and is recommended. There is a linked CD which I have not hear. 744 words and not one mention of the ***! Thanks! I came late to Dylan, finding him when I was a freshman in college, and this was the first of his albums I bought. Some of those songs are still my favorites. But I never knew who that was on the cover with him and now I do, so we're talking a 43 year old path. 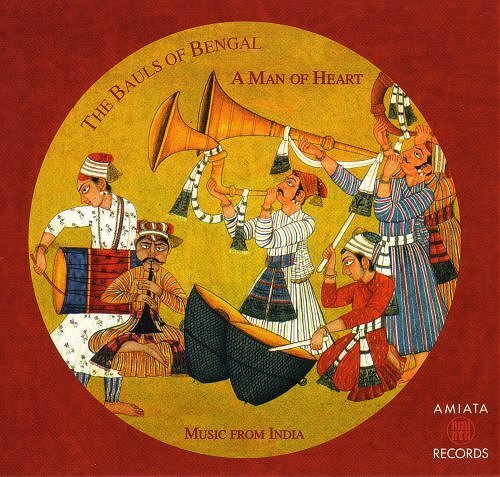 The Baul/Tagore info fascinating. So many paths. Lyle, I did not mention that the fourth person in the photo, the one in the background, is Charlie Joy. He was a stonemason and carpenter who lived near Dylan's home in Bearsville outside Woodstock. Another fascinating post, pli...one that makes me want to listen to this music! But when you say : "they are not seekers who mourn their separation from God. Instead they decry organised religion and believe that the divine exists within and can be released by joyful celebration." I'm not sure I completely agree with you. Many sufis also decried organized religion and thought the divine exists within (what else is mysticism?!). And whilst large parts of it might emphasize separation this too is meant to be 'sweet', part of the lover's game of being lost and found (not to mention madcaps, dervishes and 'diwanas'). And there's plenty of joyful celebration and festivities (at least from what I've seen of the shrines). The point being, pli, 'sufi islam' is surely too wide a phenomenon..the lines are often blurred, permeable, no? Billoo, you have it exactly right. One of the many fascinating things about this boundary zone between Sufism, Buddhism, Hinduism and the Bauls is that there are no rigid traditions. Everything is flexible; which contrasts sharply with the strict dogmas of Western religions. Is flexibility in religion a benefit or a cop-out? I'm not sure; but the strict dogmas of the West don't seem to be winning too many converts right now. pli, flexibility and openness have to be a benefit! I think her image of art (religion) as a broken circle is apt. Isn't this related to your earlier post: the need for flexibility in classical music? Doesn't that (and spontaneity) come after (or alongside) the learning of techniques, understanding, patience, 'sobriety'? Hard to say though. Personally, I think if one is to err it would be better to do so on the side of flexibility rather than on the side of rigid dogma.